Scientists hope that "playing" a tiny guitar string, the smallest ever created, will help unravel some of the secrets of the molecular world. It is made from a carbon nanotube, formed from a sheet of carbon one atom thick and rolled into a cylinder. "As a scientist, the possibility that intrigues me the most is to be able to use it to, in essence, weigh things," explained Professor Paul McEwen, who helped pioneer the string. "If you imagine that you had a guitar string and you glued a little weight on to it. It would lower the frequency at which the guitar string vibrated, because the extra mass slows it down," he told the BBC's Science In Action programme. "The same thing happens here, but our string only has a few tens of thousands of atoms in it. 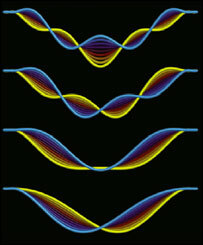 So, just a few extra atoms, maybe even one, might shift the tone of the vibration enough for us to detect it." The string of the tiny guitar is anchored at both ends, as in a full-scale single-stringed instrument. "Even the geometry scales down by a factor of a million," Dr McEwen said. This, of course, is not a string you can pluck with your fingers. "It isn't actually pulled taut initially. It's got a little bit of slack in it. But we can use an electric force to pull down on it, in the same way gravity might pull down on a string or a chain, and pull it taut that way," he said. To excite the nanotube, an oscillating voltage is applied to a metal plate underneath the string. This makes the string vibrate up and down. Similarly, the string can also be tuned to vibrate at different pitches. "We just change the DC, the static voltage on the metal plate that pulls the tube downward harder," Dr McEwen said. "It's like if on a chain we could turn up gravity. That pulls it down harder which makes it tauter and ups the frequency." Instead, it is the same frequency as the electromagnetic waves that carry radio signals. However, as these waves can be measured, it is possible to use the frequency vibrations to find the mass of individual molecules attached to the string - in effect weighing them. "If you know how much [the molecule] weighs, you know what kind of atoms are inside of it," Dr McEwen said. "This is very important in lots of chemical and biological contexts, to try to understand what an individual molecule is and this might be a whole new way of going about that task." The UK government responds to a report into nanotech with another review.